Welcome to the 2013 edition of our annual look at the fall schedules for cable and digital TV! We are launching this schedule barrage with ABC Family! As we all know, they will be adding reruns of The Middle to its line-up. Now we know when and what times! The network will launch the comedy on Monday, September 16, 2013 with a marathon from 11am-7pm. It will regularly air weekdays from 5-7pm during family time (though at times, the 6pm hour could be preempted for a long movie or original encore). On weekends, it will air in the mornings from 7-8am. 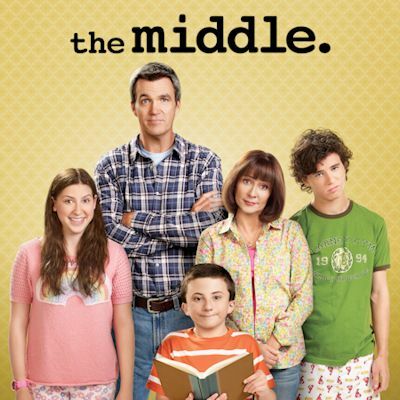 The Middle will also be coming to local broadcast syndication on Sept. 16, so check your local listings (such as in NY on WPIX) and in March 2014 The Hallmark Channel will also run the series. The series premiered in fall 2009 on ABC (Wednesdays at 8PM) and is currently entering its fifth season on ABC. The Middle stars Patricia Heaton as Frankie, Neil Flynn as Mike, Charlie McDermott as Axl, Eden Sher as Sue, Atticus Shaffer as Brick and Chris Kattan as Bob. It is created and is executive produced by Eileen Heisler and DeAnn Heline. Elsewhere on ABC Family September 2013, there will be many other schedule changes during the day starting Sept. 16. A couple sitcoms will return (8 Simple Rules and 10 Things I Hate About You), while one (Full House) will be off the schedule. Boy Meets World will move to afternoons, as the series moves out of the mornings and to 2-4pm, replacing Reba. That sitcom will slide into the 4pm hour and will be leading into The Middle. The afternoon staple That '70s Show will now move to mornings from 7:30am-9:30am, since Reba/The Middle will air late afternoon/early evening. AFV is off the line-up completely, as it was airing at 6pm. Leading off at 8am will be an episode of the ABC Family original sitcom 10 Things I Hate About You. This could be airing just temporary, since the series didn't have many episodes. After the 700 Club programming, Gilmore Girls remains at 11am. 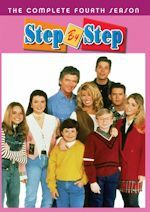 At noon, an hour of Reba will be added replacing Full House, while from 1-2pm the John Ritter comedy 8 Simple Rules returns to the schedule, also replacing Full House, as that series will be off the line-up. In primetime, there will be no original series to start the fall, but more news on original series will come soon. Movies will air from 7-11pm each weeknight until then starting Sept. 16. Melissa & Joey and Baby Daddy will have their mid-season finales on Wednesday, Sept. 4 from 8-9pm and will return likely in early 2014 or late 2013 for the remaining episodes of their season. A Melissa & Joey Labor Day marathon will air on Sept. 2 from 12pm-4:30pm and a mini-marathon on finale day on Sept. 4 from 6-8pm. Baby Daddy will have a marathon on Sept. 4 from 12-6pm. Other September original finales are The Vineyard on Tuesday, Sept. 10 at 9 and Spell-Mageddon on Wednesday, Sept. 11 at 9. 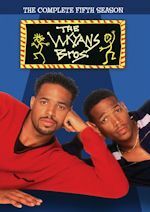 In late night, 700 Club is at 11 leading into The Fresh Prince of Bel-Air at 12 midnight. Starting Sept. 30, Fresh Prince will expand to two-hours airing from 12-2am. That's all for now, stay tuned if anything changes in October and any news on original series. We know that Pretty Little Liars will have its annual Halloween special in October, so stay tuned for a date on that along with the premiere of the spin-off series Ravenswood. View the full ABC Family September 2013 schedule with The Middle. The TCA Summer 2013 press tour continued this weekend, so we will give you a recap of what you missed. On Friday it was the third and final day for the cable portion, while on Saturday it was the first day of broadcast with NBC up first. For cable, NickMom announced that this fall they will premiere Instant Mom, its first original scripted comedy series, starring and produced by Tia Mowry-Hardrict (Sister, Sister). 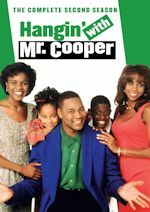 The half-hour, multi-camera series features Mowry-Hardrict as Stephanie, a party girl who trades in Cosmos for carpools when she marries Charlie (Michael Boatman, Spin City), who already has three kids. The series is picked up for 13 episodes and will premiere in the primetime NickMom block on the Nick Jr. channel, with encore episodes airing on Nick at Nite. No official premiere date and time has been announced just yet. Moving on to Lifetime, the witching hour is coming...get ready to meet the Beauchamps, the Witches of East End... Lifetime's newest drama, Witches of East End, featuring an all-star-cast headlined by Emmy Award-winner Julia Ormond (Temple Grandin, Mad Men), Mädchen Amick (Mad Men, Damages), Jenna Dewan Tatum (American Horror Story) and Rachel Boston (In Plain Sight) as a family of witches living in the secluded seaside town of East Haven, will cast its spell beginning Sunday, October 6, at 10:00pm ET/PT following the season finale of Devious Maids in late September. Also set to star are Eric Winter (The Mentalist), Daniel DiTomasso (CSI), Jason George (Mistresses, Grey's Anatomy) and Oscar and Golden Globe Award nominee Virginia Madsen (Sideways, Anna Nicole). 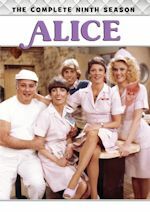 Onto NBC, in ramping up its commitment to long-form and event limited series programming along the lines of A.D.: After the Bible, which was announced last month (but won't premiere until the 2014-15 season), NBC is in early development on a handful of new projects, including a behind-the-scenes look at Hillary Rodham Clinton, an updated retelling of Rosemary's Baby, Stephen King's Tommyknockers and Plymouth, based on the epic story of the Mayflower's landing in America. The four-hour miniseries titled Hillary, based on the life of former First Lady and Secretary of State Hillary Rodham Clinton, stars Diane Lane and will be written and directed by Oscar nominee Courtney Hunt. Rosemary's Baby is a four-hour updated retelling of the bestselling novel by Ira Levin that was later adapted as a feature film about devil worship and the complex relationship between a young husband and wife. Stephen King's Tommyknockers is based on the renown author's chilling 1987 novel about how the residents of a small Maine town deal with what they believe is an alien spacecraft that has landed nearby. Limited series Plymouth, which examines the challenges and drama of the Pilgrims' journey across the Atlantic and the difficulties of settling in a new country, will be executive produced by Mark Burnett and Anne Thomopolous of Mark Burnett Productions, and Gina Matthews and Grant Sharbo. And finally for NBC, NBC Sports Group announced a new documentary on former Olympic figure skaters Nancy Kerrigan and Tonya Harding featuring an exclusive interview of Kerrigan that will air during its Sochi Winter Olympics coverage. Yesterday had a full day for Reelz TV, but we aren't covering it. CBS will continue the broadcast portion today, so come on back for a recap tomorrow on the blog for any notable highlights.